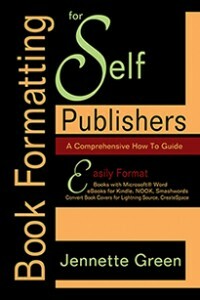 Well, I spent most of the past week converting Book Formatting for Self-Publishers into different ebook formats–specifically for Smashwords, PubIt!, and into a high quality, clickable PDF (solution not in this post). An “easy” project turned into a nightmare. Why? In a word, images. Book Formatting for Self-Publishers has approximately 150 images in the book. For the Kindle ebook, most were 96 dpi screenshots, and for the print book, I converted them all to 300 dpi, black and white. Reinserting 150 images takes a long time, by the way. When the print version was finished, I thought the hard part was over. After all, I’d already uploaded the book to KDP and the images in the .mobi format turned out fine. Not so when I next uploaded the same Microsoft Word .doc to PubIt! When I checked the images in the NOOK Previewer, the images were awful, to put it nicely. What happened? I checked out the images in the html file made when I converted the Microsoft Word doc into a “Web page, filtered” for Kindle. The images were downsampled. One example: One image was 320 KB when originally inserted into the MS Word 2003 doc, and when the “Web page, filtered” was made, the image was downsampled to 24 KB. Still, the pictures are clear in the .mobi format on Kindle. Why wasn’t that the case when I uploaded that same MS Word doc file to PubIt!? My guess is that PubIt! converts the images differently than KDP. So, how does one format a book for PubIt! that will keep the same image quality for pictures as Kindle does? After much experimenting, I discovered a simple solution to the problem. I downloaded the .mobi file from KDP to my computer. Then I uploaded that same .mobi file to Calibre, and then converted it to ePUB. Then I uploaded the ePUB to PubIt! And it worked! The images looked great. Well, there was one tiny little problem–at least it was a problem for a perfectionist, like me. I’d already included a cover image in the ebook. When you convert an ebook from one format to another in Calibre, Calibre offers the option of uploading a cover image into the ebook. Initially, I disregarded this option, since I had already included a cover image in the ebook. However, when I checked the file in the NOOK previewer, a generic Calibre title page image showed up in the ebook, just before my cover image. I did not want that. So, I went through the process again, and this time uploaded my cover image in Calibre. Now my ebook had two images–the one Calibre input for the “title page,” and the original cover that I had in the book. What was more, the Calibre cover was distorted! Now, make a new, empty zip file. Then copy the mimetype file from the EPUBFolder first, and paste it into your new zip file. Then copy all of the remaining files from your EPUBFolder (except the mimetype file) and paste them into your new zip. Rename the zip extension to .epub. Upload it to PubIt, and check it in the NOOK previewer. No more distorted cover image! You’re done! See how easy that was? Look for the book at Amazon and Barnes & Noble. This entry was posted in Book Formatting, Format a Book, Format eBooks and tagged downsampled images, ePub, Images, KDP, Microsoft Word, mobi, PubIt! Kindle. Bookmark the permalink.